Hired by the City of Portland, GreenWorks led a team of biology, engineering, and erosion consultants to investigate existing bank conditions along the Willamette River in downtown Portland. The banks were inventoried by category and then color maps were created using ArcView GIS. A “Design Notebook” containing innovative design options for the Willamette riverbank was developed for the use of both public and private developers. The options were designed to create new models for an urban riverfront while protecting threatened fish species. Incorporated into the analysis of existing conditions is a description of the defining characteristics of the Willamette River Downtown area. The notebook consists of 4 major chapters: Inventory and Background, Operating Instructions, The Design Worksheet, and Design Solutions. The Design Notebook process was carefully coordinated with the National Marine Fisheries Service, US Army Corps of Engineers, Oregon Division of State Lands and various bureaus within the City of Portland. This project received a National ASLA Honor Award in 2002 and an Oregon Chapter ASLA Merit Award in 2000. METRO’s Nature in the Neighborhood program utilizes education, restoration, monitoring and habitat-friendly development practices to ensure a healthy urban ecosystem. 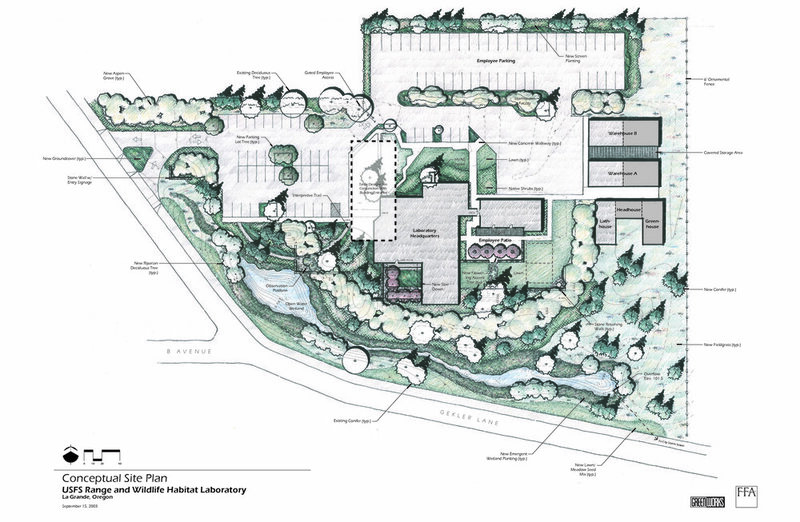 GreenWorks was contracted by METRO to conceptualize and develop watercolor illustrations depicting habitat -friendly design solutions for development adjacent to or near urban fish and wildlife habitat. Solutions depict various lands uses (single and multi-family residential; mixed-use; parking areas; and street ROW) and included greenroofs, raingardens, green streets, on-site / neighborhood / regional stormwater detention, treatment and infiltration features, pervious pavement, reduced pavement surfaces, reduced lawn areas, and downspout disconnects. GreenWorks was part of an inter-disciplinary team developing a long range sustainable redevelopment plan for a mixed-use, 35 block (54 acre) area in Northeast Portland. GreenWorks’ primary responsibility was developing an open space network strategy, sustainable streetscape design concepts, rainwater harvesting on a large scale, habitat creation, and dense urban forestry approaches for the area. We also looked at creating a connection between the Lloyd District and the Willamette River through Sullivans Gulch as it existed historically. In addition to developing guidelines for the entire project area, GreenWorks developed a sustainable site plan for the “Catalyst Project.” This is a financially feasible, two-block initial phase which implements the overall district plan on a smaller scale. The “Catalyst Project” also includes the schematic design of a new public park adjacent to the development. This project received an ASLA Honor Award in the Analysis and Planning Category, 2005; AIA Committee on the Environment, Top Ten Award, 2005; and Commendation Award, Seattle AIA Honor Awards, Washington Architecture Program, 2004. GreenWorks prepared a site analysis to identify areas of security venerability for this important US Forest Service research laboratory, as well as areas needing improved access for people with disabilities. Following this, we developed a site improvement plan that addressed security and access improvements for the compound. In addition to improving security, the project will also improve public contact, provide improved opportunities for community use of the lab, provide improved outdoor gathering and recreation space for employees, and decrease landscape maintenance by increasing the number of native plant species. GreenWorks as part of Team Oregon in collaboration with SOM, developed a Master Plan for the Historic Canal through Hangzhou, China. The 1200-year-old canal flows over 100 miles north-south from Beijing to Hangzhou. The canal will be redeveloped as a centerpiece of Hangzhou, celebrating the ecology, history and urban vitality of this historic city. New stormwater facilities will be developed in each of four canal segments each with interpretive and recreational amenities to help cleanse and purify the water in the canal. With a multi-disciplinary team that includes GreenWorks, the project provides a sustainable blueprint to improve, locate, and develop tourism facilities and infrastructure within the Cape Kiwanda Focus Area. The goals were to create a framework for tourism facilities and infrastructure to protect the beauty and natural resource values; minimize and mitigate the adverse effects of visitors; improve the visitor experience; and attract and accommodate new visitors to the region. The team collaborated with over a dozen county, state and federal agencies, including Tillamook County Parks Department and Oregon Parks and Recreation Department, and hosted public information sessions with residents, businesses and community organizations to craft recommendations for improvements to existing infrastructure. Master plan work was completed in 2016.